Cigarette packets often carry the warning to “protect children: don’t make them breathe your smoke”. In 2014, the Kenyan government attempted to do just that – banning the sale of single cigarettes, banning smoking in vehicles with a child and keeping the tobacco industry out of initiatives aimed at children and young people. But as the Guardian reported last week, British American Tobacco, in an effort to keep Kenyans breathing their smoke, fought the regulations on the grounds that they “constitute an unjustifiable barrier to international trade”. In fact, big tobacco has a long history of using trade and investment rules to force their products on markets in the global south and attack laws and threaten lawmakers that attempt to control tobacco use. Back in the 1980s, as cigarette consumption fell off in North America and western Europe, US trade officials worked aggressively to grant American companies access to markets in Asia, demanding not only the right to sell their products, but also the right to advertise, sponsor sports events and run free promotions. Smoking rates surged. In the 1990s, World Trade Organisation agreements led to a liberalisation of the international tobacco trade, with countries reducing import tariffs on tobacco products. The impact, according to a joint study of the World Health Organisation and the World Bank, was a 5% increase in global cigarette consumption and accompanying mortality rates. Big tobacco’s lawyers were quick to discover the value of “next generation” trade agreements. In the 1990s, Canada dropped a plain packaging initiative after US manufacturers threatened a suit using the first next-gen trade deal, the North American Free Trade Agreement (Nafta). A few years later, Philip Morris threatened Canada again after it prohibited terms such as “light” and “mild” cigarettes. Philip Morris argued it would be owed millions in compensation for damage to its brand identity. Philip Morris was able to credibly wield this threat because of the extraordinary powers that Nafta grants international corporations: the right to sue governments in private tribunals over regulations that affect their profits. A toxic combination of far-reaching and poorly defined “rights” for investors, eye-watering legal costs, and tribunals composed of corporate lawyers with the power to set limitless awards against governments makes investment arbitration and the modern “trade” agreement a formidable weapon to intimidate regulators. And what big tobacco learned in the global north it has been replicating in the global south, where threats carry greater force against poorer countries that may lack the resources to see down a legal challenge. In 2010, Philip Morris launched a $25m claim against Uruguay after it introduced graphic warnings on cigarette packs. Though Uruguay successfully defended the measure, it still faced millions in legal costs. And Philip Morris effectively won, as Costa Rica and Paraguay held off introducing similar measures. Such are the fears around big tobacco’s aggressive use of trade and investment rules that the US-negotiated Trans-Pacific Partnership trade deal featured a carve-out excluding big tobacco from investment protections – an explicit admission of the problem. But this does not go far enough. The important thing to realise is that the problem goes beyond big tobacco. Big oil, big pharma and big mining follow the same playbook, launching investment arbitration cases to defend their business models from governments that would regulate to protect public health, the local environment or the climate. Rather than target individual companies or sectors, we must push our governments to reform trade and investment rules that grant such extraordinary powers to corporations. That means removing special investor rights and investment courts from trade agreements. It means removing limits on the freedom of governments to protect public health, labour and human rights and the environment. Of course, this is easier said than done. Robert Lighthizer, US trade representative, served as deputy in a Reagan administration that pressured countries to open their tobacco markets to US exporters in the 1980s. Vice-President Mike Pence’s record includes opposing smoking regulation, taking huge campaign donations from big tobacco, and denying the causal link between smoking and lung cancer. The EU commission, meanwhile, has been criticized for its meetings with big tobacco while it was negotiating EU-US trade talks. The good news is that from Brazil to India to Ecuador, countries are stepping away from outdated trade and investment rules. In the UK, the Labour party manifesto opposes parallel courts for multinationals and proposes to review the UK’s investment treaties. But until we scrap the powers that we grant big tobacco and others to frustrate and bypass our laws, efforts around the world to protect public health will continue to go up in smoke. THREE years ago, the government of Togo, which has a gross domestic product of $4 billion, received a letter from Philip Morris International, a tobacco giant which last year earned revenues of $74 billion. The country had been mulling bringing in plain packaging for cigarette boxes. It would risk “violating the Togolese constitution”, the firm’s subsidiary explained, “providing tobacco manufacturers the right to significant compensation.” It then outlined how plain packaging would violate binding global and regional agreements. Togo was in no position to anger its international partners, it suggested. For health advocates, such tactics are the last refuge of firms they have long denounced. But tobacco companies will do what they can to protect their packaging. They detest warnings with repulsive images of decaying body parts. In 2010 Philip Morris sued Uruguay, claiming that big warnings on boxes violated a trade deal. Then two years later Australia became the first country to go further, banishing iconic trademarks from tobacco packs. Its law mandates that brand names—such as Marlboro, Winfield or Dunhill—appear in grey type against a background of Pantone 448C, a putrid green deemed the world’s ugliest colour by a market-research firm. So tobacco firms sued—in Australian courts, before a UN tribunal and by supporting countries that challenged the rule before the World Trade Organisation (WTO) on the ground that banning trademarks represents an expropriation of intellectual property (IP). Less formally, they and allies have lobbied against warnings and plain packaging in places ranging from Namibia to New Zealand. It has all been surprisingly effective. Until very recently, Australia has been the only country to ban tobacco trademarks from cigarette packs. Such avenues may be closing. Although the WTO’s decision is still pending, firms lost their other suits against Australia. Last month arbitrators at the World Bank threw out the lawsuit against Uruguay. In May the European Court of Justice upheld a rule on big warnings and Britain’s High Court confirmed one for plain packaging. It seems likely that more governments will in future prioritise public health over IP. Canada, France and Ireland are already moving towards plain packs. If so, ugly packaging could become the most damaging rule tobacco firms have faced in years. To date many laws have hurt firms in some ways but also, strangely, helped them in others. Bans on advertising lower their costs. Small competitors, unable to advertise, struggle to grow. High excise taxes can be another boon: when taxes are fixed and large, a big increase in the underlying price of a pack amounts to a relatively small rise in the pack’s total price. High prices have sustained tobacco firms, even as smoking rates decline. “They probably have the best pricing power of any industry,” says James Bushnell of Exane BNP Paribas, a broker. But plain packaging clamps down on one of their last bits of advertising. The design of the box is where they must convey not only the name of the brand but abstract qualities, such as masculinity or the idea that a product is “premium”, and worth an extra outlay. If such traits are stripped from packs, consumers may choose cheaper brands. That is particularly worrisome in emerging markets, says Mr Bushnell, where standard packs would threaten the aspirational appeal of smoking. Other “sin” industries are worried. The International Trademark Association frets that governments might strip trademarks from junk food and liquor. It may become pointless for cigarette firms to start legal proceedings. The Trans-Pacific Partnership (TPP), a pending free-trade agreement among 12 countries, shields governments from lawsuits over tobacco rules. It may unravel, but future pacts could have similar terms. Only America, where the right to free speech makes standard packs highly unlikely, may remain an anomaly (though it is a signatory to the TPP). In the past investors often viewed a new wave of rules on tobacco as a chance to buy tobacco stocks inexpensively, before they resumed their steady rise. This time may be different. Is TPP a public health threat? The Government should bar certain industries from exploiting the Trans-Pacific Partnership (TPP) lest they damage public health, health activists warned recently. The historic free trade agreement is set to create a freer flow of commerce and win-win trade among its members by establishing a level playing field for all parties and investors. Yet it might challenge the Government to implement measures to protect the public health when some industries, like tobacco and alcohol, take advantage of the TPP to expand their businesses, said Mary Sunta, a senior policy consultant of the Southeast Asia Tobacco Control Alliance. She addressed the issue at a workshop on the impacts of TPP on public health held in Ha Noi yesterday. “As far as I am concerned, there are seven chapters in the TPP vulnerable to any challengers of the tobacco industry,” Sunta said. Those chapters include provisions regarding tariff removal, which could result in lower cigarette prices and a cigarette package without pictorial warnings. “As a matter of fact, applying a higher tariff/tax on cigarettes and its selling prices is proven to be the most effective strategy to reduce the tobacco demand in the short-term,” Sunta said. Statistics of the World Health Organisation (WHO) show that Viet Nam is ranked 15th in the world in terms of the number of smokers – about 40 per cent of men smoke. About 72,800 people died of tobacco-caused diseases, equal to a loss of roughly US$78 million every year, according to the Tobacco Atlas. TPP’s provisions are likely to cause a similar headache for the Government in another health-affected industry in Viet Nam that has shown remarkable growth in the last decade: the alcohol industry. Member parties of the TPP committed to bring the tariffs of alcoholic beverages, from beer to wine and whiskies, down to zero over a 12-year span. The TPP enactment is expected to open wide the door for foreign alcoholic beverage manufacturers, especially from the US, into the Vietnamese market, which has already been seeing a strong growth of demand averaging 10 per cent a year. Efforts to force higher price tags on the beverages to reduce the alcohol consumption are deemed difficult for the Vietnamese Government due to the tariff removal commitment in the TPP, while criticism from other states and alcohol manufacturers might hurt Viet Nam in implementing other measures, like limiting advertisement and stamping health warnings on the products. Those measures are likely to be categorised as technical barriers to trade. The TPP includes a legal mechanism to settle disputes between foreign investors and their host country, called the ISDS (Investor-State Dispute Settlement). Under the IDSD, foreign investors can legally challenge host state regulations outside that country’s courts. The ISDS has been used several times since its introduction in international trade agreements, most notably by the tobacco industry. Many countries like Thailand, Australia, Uruguay and Sri Lanka were sued by tobacco companies when they tried to pass a law on the cigarette packaging to raise public awareness of the dangers of smoking. The ISDS is also available to claims by alcohol or asbestos producers. “Asbestos was found to cause cancers since 2001. Any companies that import, distribute and use asbestos should be exempted from the IDSD provision,” said Tran Tuan from the Advocacy Network on Banning Asbestos Use in Viet Nam (VN-BAN). Viet Nam is among the top 10 countries in the world using asbestos – a carcinogenic substance as categorised by the International Agency for Research on Cancer (IARC). The historic TPP was signed on February 4, 2016 in Auckland by 12 states including Viet Nam, Brunei, Malaysia, Singapore, Chile, Peru, Canada, Japan, Australia, New Zealand, Mexico and the United States, after seven years of negotiations. The trade agreement is awaiting ratification by each of its member countries before entering into force. Viet Nam expects to ratify the agreement late this year. As an attorney general, I sued the tobacco companies. ExxonMobil is nothing like them. I was one of 46 state attorneys general who signed the tobacco Master Settlement Agreement in November 1998. On behalf of New York’s taxpayers, I filed one of the suits that eventually pushed the cigarette makers to settle. I can tell you from experience that our fight against the tobacco industry has almost nothing in common with today’s campaign by several state attorneys general against ExxonMobil — despite what supporters of the effort would like you to believe. The tobacco campaign was highly successful. The settlement agreement included not only direct payments to the states (currently $9 billion a year) but also imposed severe marketing restrictions to limit outreach to young smokers. Largely as a result, the proportion of high school student smokers dropped from 36 percent in 1997 to just 16 percent in 2013; adult smokers, from 25 to 17 percent. I was proud to play a major role in holding tobacco companies responsible for the damage they caused and in setting America on a healthier path. We had a clear, convincing legal case and a noble cause. The same cannot be said for attorneys general involved in the current crusade. It’s unlikely they will be successful in their legal actions, and their actions may have already chilled free speech in this country. ExxonMobil was subpoenaed last fall by New York Attorney General Eric Schneiderman (D) in an effort to find out whether the company misled investors and the public on the impact of climate change. Massachusetts joined in. Then, in March, the Virgin Islands, a U.S. territory, started investigating ExxonMobil, as well as think tanks and other institutions that received the company’s support, under an anti-racketeering law. Later that month, 16 state attorneys general, all Democrats, held a news conference under the banner, “AGs United for Clean Power,” to announce they too will pursue energy companies that challenge the global-warming orthodoxy. But increasingly, Schneiderman appears to be on his own. Last week, Claude Walker, the attorney general for the Virgin Islands who opened a racketeering probe of ExxonMobil, withdrew his subpoena. And Maura Healey, attorney general for Massachusetts, delayed action on her own subpoena of ExxonMobil, meaning that case has paused. Attorney General Schneiderman’s theory is apparently that ExxonMobil pulled the wool over America’s eyes by manipulating public opinion. “There is confusion,” he said, “sowed by those with an interest in profiting from the confusion and creating misperceptions in the eyes of the American public.” One could argue that the same confusion and misperception has been caused by alternative energy proponents. Causing confusion — if that’s what happened — is hardly a crime, but to hold one party to a national debate to a higher standard tilts the debate unfairly in the other direction. Notably, the attorney general is pursuing his investigation under the Martin Act, a sweeping New York law that I know well. It gives the attorney general broad subpoena power, and it allows charges to be filed even without evidence that the defendant intended to commit fraud. It is a powerful tool to protect investors but can have unintended negative implications to the very investors it seeks to protect. In the case of tobacco, we found that the companies knew about the life-threatening, addictive nature of smoking but covered up that knowledge. In the case of global warming, ExxonMobil began research as early as the 1970s and was open about what it found in more than 50 papers published in scientific journals between 1983 and 2014, according to company documents. ExxonMobil’s scientists have participated in the U.N. Intergovernmental Panel on Climate Change since its inception and were involved in the National Academy of Sciences review of the third U.S. National Climate Assessment Report. The tobacco companies were deceivers. ExxonMobil has been open. But that doesn’t seem to matter to the politicized attorneys general pursuing the company. A chilling impact on public debate is not in our collective interest. Here’s how cigarette packs could soon look – a standard package with gruesome warning image. The packaging was revealed at a smokefree event on Wellington’s waterfront and could be rolled out early next year. The prop design at the event is not the final design – the Government will now consult on plain packaging, including design for packs. 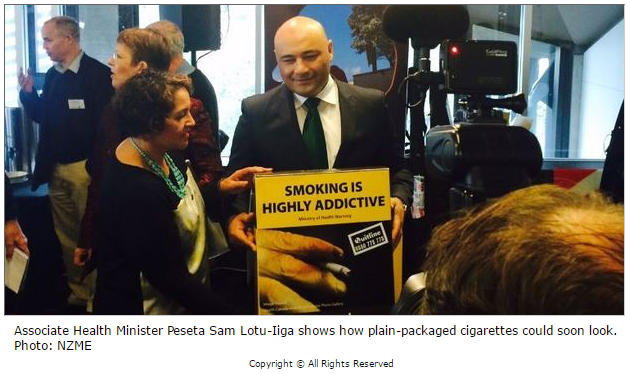 Associate Health Minister Peseta Sam Lotu-Iiga has released draft regulations and a consultation document which aims to standardise the look of cigarette packs. “The design and appearance of cigarette packets are powerful marketing tools for vendors. The Government is proposing to use the standard brown-green packaging which is similar to what is used in Australia,” Mr Lotu-Iiga said. Plain packaging is likely to be in place early next year – but officials need better information before deciding if e-cigarettes can be made legal, Prime Minister John Key says. Tax on tobacco will be significantly hiked and the Government will forge ahead with plain packaging, despite a legal risk backed by tobacco giants. “Nothing kills you with greater predictability than smoking,” Mr Key said of the plain-packaging change. Certain tobacco researchers are urging the removal of restrictions on buying e-cigarettes containing nicotine. Nicotine patches and gum can be bought, but nicotine e-cigarette liquid must be bought from overseas. Other countries, like the UK, allow the products to be sold in supermarkets and dairies. However, there are fears young people could use the devices. Mr Key said he had received advice on the usefulness of e-cigarettes and vaping. “The advice I’m getting so far is that there may be a role for e-cigarettes in terms of people transitioning away from smoking. But I think the health impacts are very unknown at this point. So there is some concern, at least by officials, that there may be long-term health impacts. Maori Party co-leader Marama Fox told the smokefree gathering that politicians should lead by example and make the Parliamentary precinct smokefree. That led to a crack from Labour MP Rino Tirikatene, who tweeted that the Maori Party and their “mates” National were “slowly turning Aotearoa into a kuia state”. Labour leader Andrew Little said he needed better information before making a call on whether e-cigarettes should be made available. Plain packaging was supported by Labour. Australia won the case against Philip Morris in December. The WTO challenge is ongoing, but Mr Key has said he received advice late last year that the Government was on a “firm footing” to progress plain packaging because several other countries, including the UK and Ireland, had introduced it. These countries did not face a challenge under the WTO. The Trans Pacific Partnership (TPP), signed on February 4, also allows tobacco-control measures, so New Zealand could advance anti-smoking policies without risking a legal challenge. A pack of 20 cigarettes will increase from about $20 now to around $30 in 2020 after hefty excise increases were announced as part of last week’s Budget. It will affect the about 15 per cent of adult New Zealanders who smoke each day – about 550,000 people. That rate increases to 35 per cent for Maori, and 22 per cent for Pacific people. The tax hikes are part of measures designed to make New Zealand smoke-free by 2025, a key goal of the Maori Party. Asked if that was realistic, Mr Key said his confidence was increasing, as there was increasing momentum behind the smokefree movement. Doubts about the controversial EU-US trade pact are mounting after the French president threatened to block the deal. François Hollande said on Tuesday he would reject the Transatlantic Trade and Investment Partnership “at this stage” because France was opposed to unregulated free trade. All 28 EU member states and the European parliament will have to ratify TTIP before it comes into force. But that day seems further away than ever, with talks bogged down after 13 rounds of negotiations spread over nearly three years. The gulf between the two sides was highlighted by a massive leak of documents on Monday, first reported by the Guardian, which revealed “irreconcilable” differences on consumer protection and animal welfare standards. The publication of 248 pages of negotiating texts and internal positions, obtained by Greenpeace and seen by the Guardian, showed that the two sides remain far apart on how to align regulations on environment and consumer protection. Greenpeace said the leak demonstrated that the EU and the US were in a race to the bottom on health and environmental standards, but negotiators on both sides rejected these claims. The European commission, which leads negotiations on behalf of the EU, dismissed the “alarmist headlines” as “a storm in a teacup”. But Tuesday’s comments from the heart of the French government reveal how difficult TTIP negotiations have become. France has always had the biggest doubts about TTIP. In 2013 the French government secured an exemption for its film industry from TTIP talks to try to shelter French-language productions from Hollywood dominance. Hollande, who is beset by dire poll ratings, indicated on Tuesday that the government has other concerns about TTIP. Speaking at a conference on the history of the left, Hollande said he would never accept “the undermining of the essential principles of our agriculture, our culture, of mutual access to public markets”. Fekl told French radio that the agreement on the table is “a bad deal”. “Europe is offering a lot and we are getting very little in return. That is unacceptable,” he said. The director of Greenpeace EU, Jorgo Riss, said the French president’s concern was “unsurprising given that the commission is clearly not following the mandate it was given by EU countries to protect European environmental and health standards”. The question marks over TTIP are a setback for the British prime minister, David Cameron, who last year vowed to put “rocket boosters” under the talks as he described TTIP as “a deal we want”. But Barack Obama has made it clear that the UK would not get any special treatment if it left the EU and tried to negotiate a separate trade deal. On a visit to London last month, the US president said the UK would be at “the back of the queue” in any post-Brexit trade talks. The most recent round of TTIP negotiations took place last week, where EU and US officials reiterated that they hoped to reach a deal in the second half of 2016, before Barack Obama leaves the White House next January. Talks began in July 2013, but rapidly became bogged down amid widespread public concern on both sides of the Atlantic. Reducing tariffs is only a small element of the trade pact. The most contentious issues centre on aligning consumer and environmental standards and opening up markets to transatlantic rivals. Transparency is essential to ensure decisions about health standards are made democratically, particularly regarding policies such as TTIP which influence public health. As Greenpeace has stated, there has been worldwide criticism, including from the European Ombudsman, about the ongoing refusal to reveal what is being negotiated under TTIP. Whilst some EU documents are disclosed, US negotiators disclose almost nothing at all. While Commissioner Malmström has argued in her latest blog in reaction to the leak that the consolidated texts are not the final text in TTIP, EPHA still maintains its concerns regarding how those texts will be negotiated into the final, legally binding treaty. To allay public and civil society concerns, the documents need to be made freely available. While the main focus is on non-tariff barriers and the right to regulate, there are still significant tariffs on some health-harmful goods including tobacco and processed foods high in salt, sugar and fats. We must not miss the point that removal of tariffs on health-harmful goods will also further accelerate the epidemic of chronic diseases in Europe, such as type-2 diabetes, cardiovascular diseases, respiratory diseases and cancers. So far the Commission has neglected to evaluate the health impact, but no doubt it would offset a significant portion of the purported economic benefits of TTIP. • Investment Dispute Settlement – It is worrying that this does not appear to include appropriate safeguards for the right to regulate for public health in the proposal and interestingly, there is no general exception of tobacco control measures ( ‘tobacco carve out’). EPHA is calling for a public health carve out instead of a tobacco carve out. • Agriculture – As well as our concerns regarding the link between increased trade of agricultural products and diet-related chronic diseases, it is particularly worrying that the EU proposal on Wine and Spirits in this chapter does not mention either reducing alcohol related harm, health-specific aspects of labelling or health NGO involvement. 1. TTIP should support the Sustainable Development Goals (SDG) – Today’s main public health challenges both in the EU and the US are chronic diseases, overweight and obesity, largely avoidable and linked to unhealthy food, tobacco and alcohol, as well as the rising threat of drug-resistant infections (antimicrobial resistance) which could undermine all the progress made against infectious diseases around the world in recent decades. TTIP cannot be sustainable if it fails to address the public health aspects of trade. We call for a Public Health Sustainable Development chapter in TTIP, to ensure that trade agreements actively support healthier societies. 2. TTIP must reinforce the global Framework Convention on Tobacco Control (FCTC) – Given the deadly impacts of tobacco consumption around the world, TTIP should not be neutral in relation to tobacco. It must not increase the availability, affordability or attractiveness of tobacco products. TTIP must be brought into line with the FCTC, meaning tobacco lobbyists must be actively excluded from influencing the trade negotiators in both the US and EU. Governments must be actively encouraged to introduce stricter tobacco control policies such as plain tobacco packaging. 3. TTIP must take a responsible stance on alcohol – Like tobacco, alcohol is a commodity where increased availability and lower prices are likely to have a negative impact on public health, society and economy. When negotiating the ’Wine and Spirits’ Chapter, which is a priority for the EU, negotiators should take into account the findings of a recent OECD report on alcohol related harm. 4. Consider health impacts of removing tariffs on unhealthy food – There are still significant tariffs on unhealthy processed foods from the US that TTIP may seek to remove. Increased consumption of unhealthy food (processed foods high in saturated fat, sugar and salt) is not beneficial for the consumer nor the country as a whole, as high rates of diseases related to malnutrition, overweight and obesity impose a threat to economic productivity. While public interest civil society organisations raised concerns about Agriculture as a sensitive issue, the European Commission has not yet assessed the significant health impacts of tariff reductions on unhealthy food or looked at measures to mitigate harm to health. 5. TTIP should aim to make medicines more affordable – While there is no discussion yet of ’Pricing and Reimbursement’ measures in TTIP which would undermine governments’ ability to make policy decisions, TTIP should tackle the different forms of abuses of patent protection which make essential medicines unaffordable for many. The negotiations on regulatory cooperation on pharmaceuticals aiming at eliminating duplications in trials and testing, should aim to make medicines cheaper. Medicines price evolution should be monitored by the Commission to ensure this is the case. 6. Investment protection must not undermine public health legislation – Neither an Investor-to-State Dispute Settlement (ISDS) nor a parallel Investment Court System (ICS) are necessary in TTIP as both the US and the EU are stable democracies, with mature established Court systems and legislatures. Nevertheless, any investment protection system should not allow claims questioning public health legislation (eg. those tackling key causes of disease such as alcohol, tobacco or unhealthy food). 7. Horizontal chapters on Regulatory Cooperation and ’Good Regulatory Practices’ must not restrict future public health policy – Regulatory Cooperation should not limit the health policy space available for governments to protect and improve public health. Regulatory autonomy is required for governments to tackle today’s main public health challenges: chronic diseases, overweight and obesity, and drug-resistant infections. Council chief Cheah says Putrajaya must have the political will to control tobacco use. PETALING JAYA: The Malaysian Council for Tobacco Control (MCTC) has alleged that the government lacks the political will to control tobacco use to ensure that young Malaysians don’t develop the smoking habit. Speaking to FMT, MTMC President Molly Cheah said she hoped Putrajaya would use the time allocated under the Trans-Pacific Partnership Agreement (TPPA) to finally come up with a Tobacco Act. Countries committed to signing the TPPA are given two years to amend existing laws or enact new ones before the agreement comes into effect. Instead, she said, the government seemed content to control tobacco use through what she called an “archaic” provision of the Food Act 1983. However, Cheah commended the Ministry of Health for planning to implement a rule requiring plain packaging of tobacco products, saying the measure had shown positive results in other countries. She dismissed the notion that the move would have repercussions on intellectual property rights, noting that Australia, one of the TPP partners, was already successful in implementing it.